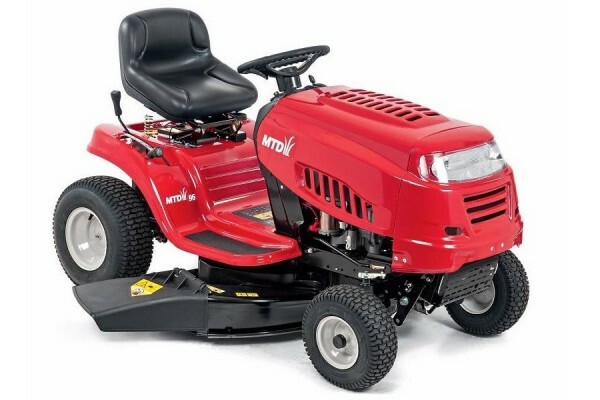 Product code: MTD96 Categories: 4-Stroke, CLEARANCE, CLEARANCE / SALE ITEMS, Lawnmowers, Ride On. The MTD96 is a special edition lawn tractor and the entry-level machine in MTD’s “Rouge” line. 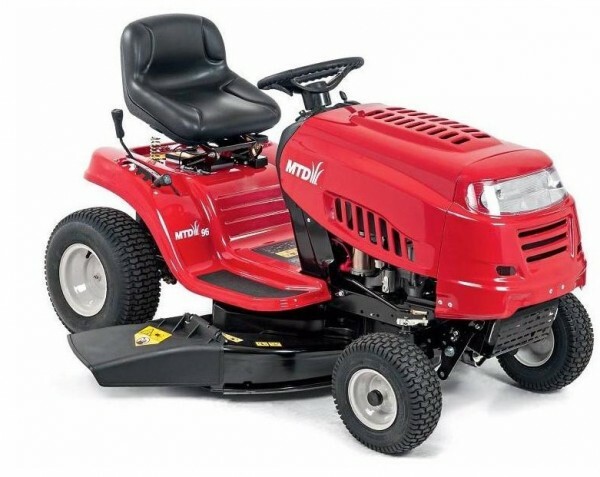 Powered by a reliable 420cc MTD ThorX overhead valve single cylinder engine, the MTD96 is a practical and robust lawn tractor which delivers smooth, quiet and efficient performance, ideal for gardens up to 2500 square metres in size. Equipped with a 96cm (38″) twin-bladed cutter deck, this side discharge garden tractor can cope with a variety of grass conditions at a higher work rate than a rear collect lawn tractor. It is also equipped with MTD’s innovative shift-on-the-go transmatic transmission which allows smooth ‘change on the move’ acceleration from neutral to a selectable top speed by simply depressing the foot pedal to allow efficient and safe operation in confined areas. The cutting height can be adjusted through five stages between 30-95mm to suit conditions and the desired lawn finish. The rugged steel construction and powerful MTD engine combine to transform the MTD96 into the perfect year-round workhorse when towing one of the many lawn tractor attachments available. Large wheels and a heavy-duty front axle make this lawn tractor suitable for rougher ground such as orchards and paddocks. The notably tight turning radius of 18″ / 46cm make this lawn tractor ideal for mowing in tight spaces and around obstacles, whilst turf saving tyres prevent damage to the lawn.